We believe that the more you know about us the more reasons you have to use us for you home inspection needs. We have decided to share some of our endeavors with you on this page. Gardening is Devona's passion and we have been gardening our 5 acres in Kansas City since 1986. Each year we have planted and tried new and different types of flowers and vegetables. We have decided to start sharing some of our successes. Here are some pictures. Several types of roses are grown on our property. Above is a picture of a bananna tree setting banannas. Typical garden in June. Fence to block deer. Back field is being baled. View of Barn and garden from the field fenced for chickens. One of my latest projects - ISS transiting the Sun (some clouds got in the way) but try zooming in on the picture. Orion Nebula (M42) from Davis Mountains 12-25-2019. We might be adding more pictures as time and space permit. Let us know what you think. We look forward to working with you on your home inspection needs. Gary is an amateur astronomer and is a member of the Astronomical Society of Kansas City. He volunteers at Powell Observatory in Louisburg, Kansas with ASKC as well as other Star Parties. We decided that we should start sharing some of his efforts with you. Aug 21, 2017 Total Solar Eclipse: Gary and Devona looked at the weather forecast for Missouri eclipse viewing and it did not look promising. We decided to leave for Casper, Wyoming where the forcast was for less than 2% clouds. We set up on the West side of Muddy Mountain (South of Casper, Wyoming on BLM property) 60 feet away from a cliff to see the incoming shadow. For the pictures below we recorded the eclipse using an 8" F4 912 mm focal length Schmidt Newtonian telescope and K10 Pentax DSLR at prime focus. Using an intervelometer we took pictures every 30 seconds from 1st contact to 4th contact and many more during totality. Some of our results are shown below. We are looking forward to the next Total Solar Eclipse in the USA on April 8, 2024. 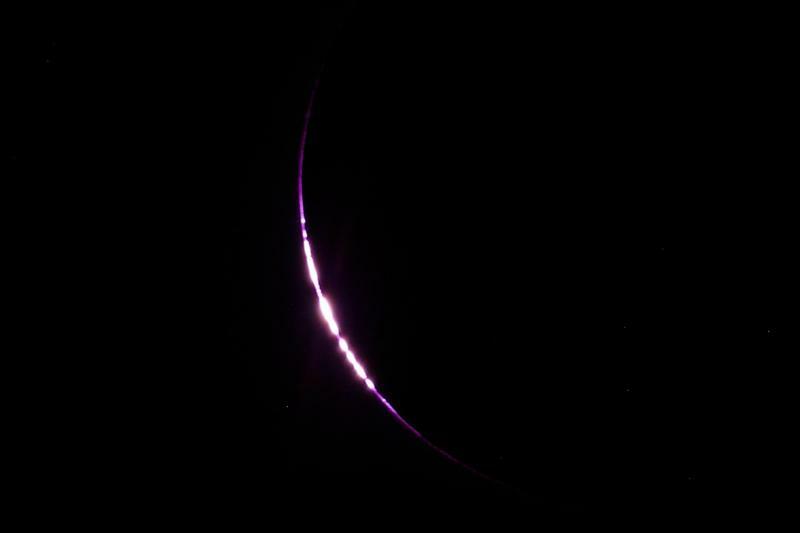 Below: Bailey's Beads just before totality starts (solar filter still on). Below: Corona during totality - no filter. Below: Solar Prominences and Flares during totality - no filter. Below: Diamond ring just as totality was ending - no filter. Below: Our locaction for viewing the eclipse - 60 feet away from cliff so we could see the incoming shadow. Below: Telescopes set up for August 21, 2017 eclipse viewing/picture taking. Scope is 8" Schmidt Newtonian F4 with Pentax K10 DSLR taking pictures. Finder scope is 80mm f4 for visual observing. Quilt is blocking wind and Sun from large TV screen (camera projecting pictures onto screen in real time). Antenna on tracking mount is recoring the Radio Sun during the eclipse using ICom R7000 reciever at 324Mhz using SkyPipe data logging. On Bureau of Land Management areas you need to be self contained; quiet generator, heating, cooling, refrigerator, microwave, porta pottie, etc. The 1 1/2 miles of rutted dirt road to get to the cliff should not be tried during wet conditions (our van is all wheel drive). If you want to come observing with us see ASKC.org . Powell Observatory is available for rent. 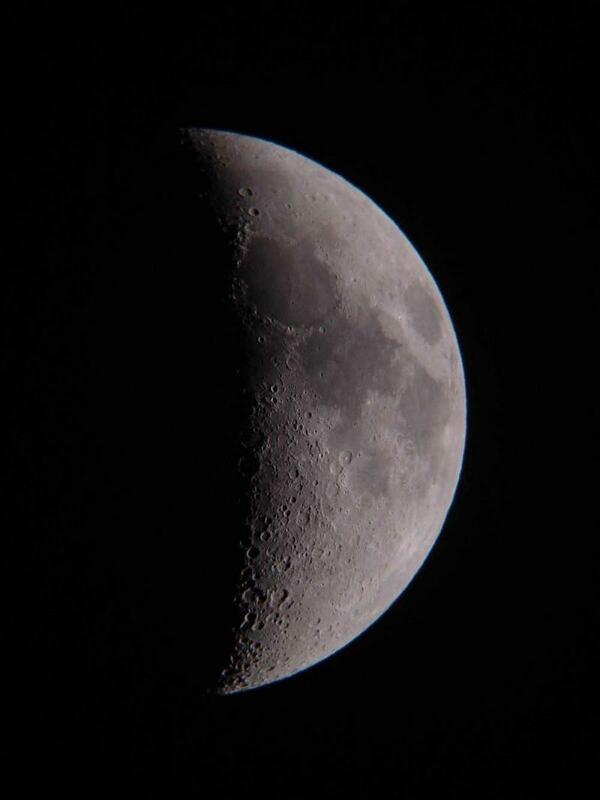 All pictures here were taken by Gary over the years with various types of telescopes and cameras. Most taken with my favorite 10" reflector shown below.